Where does the time go? Summer is finally showing some good weather. Thus, the corn is almost ready to harvest. I haven't seen any rodents skulking around, but I'd be surprised if they didn't make efforts towards the corn in the next couple of weeks. I have put "corn cozies" on the most promising dozen ears, but cannot afford to buy/create any more right now. Furthermore, the two bell pepper plants are showing promise and have a good half dozen peppers currently maturing. Also, I've been steadily picking beans the last several weeks. Unfortunately, a few of the plants are showing signs of club root. This is the first year I've tried bush beans, but I think I'll go back to pole beans next year. 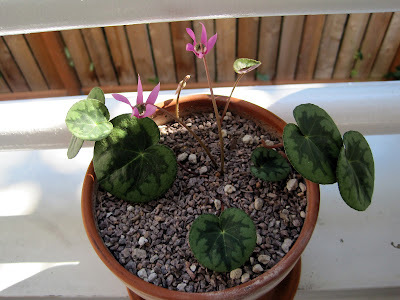 As for cyclamen...I've determined all of the hardy varieties (hederifolium, cilicium, etc.) in my plots are getting too much sun and water. I'm going to research some taller, drought-tolerant species to place nearby and provide some much needed shade. This is the first time I've noticed the cilicium has thrived, but it's because the fuchsia grew over it. I need to begin planning my plot better, clustering less water plants and shade plants together. Currently, everything is mixed up, and several species are suffering (particularly the dicentra and cyclamen). Two pots on the deck are currently coming along nicely. The small purpurascens tuber (two pics up) from Hansen's Nursery is showing healthy new growth, a few blooms, and no leaf die-off. 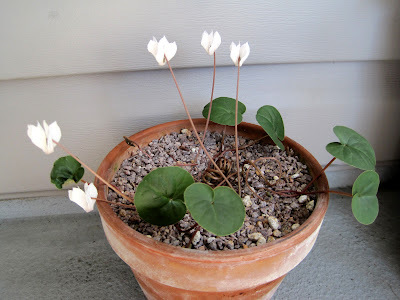 The other, more established purpurascens from Swanson's, shows continuous growth, but most of the older leaves sicken and die. I don't attribute this to excess water as leaves continue to die off even when I withhold water. I'm thinking the issue is do to some form of insect or potentially a soil deficiency. Certainly, I will need to further research the problem. 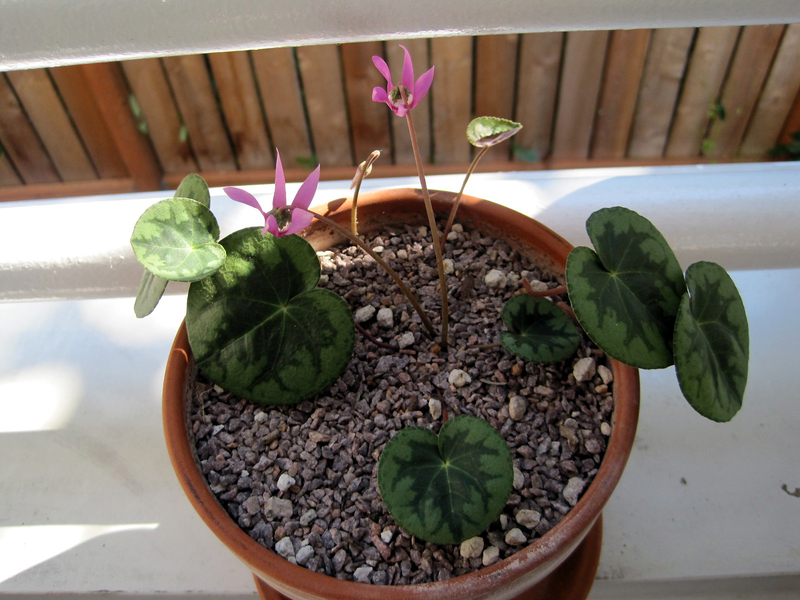 Finally, the intaminatum (pictured directly above (white flowers)) has gone from a couple of of leaves and flowers, and now shows much more growth, with more still on the way.